Ever heard the sayings about finding what you were looking for without even knowing you were looking for it? It’s often said about great loves and solutions to problems that we didn’t even know we had – and both are relevant in this case to me. Now I love Clinique anyway – their recent Crayola Collaboration was one of the most fun collabs I’ve seen so far this year and their Fresh Pressed Challenge was really nice for my skin. So I’m firmly of the belief that Clinique are bossing it right now anyway. 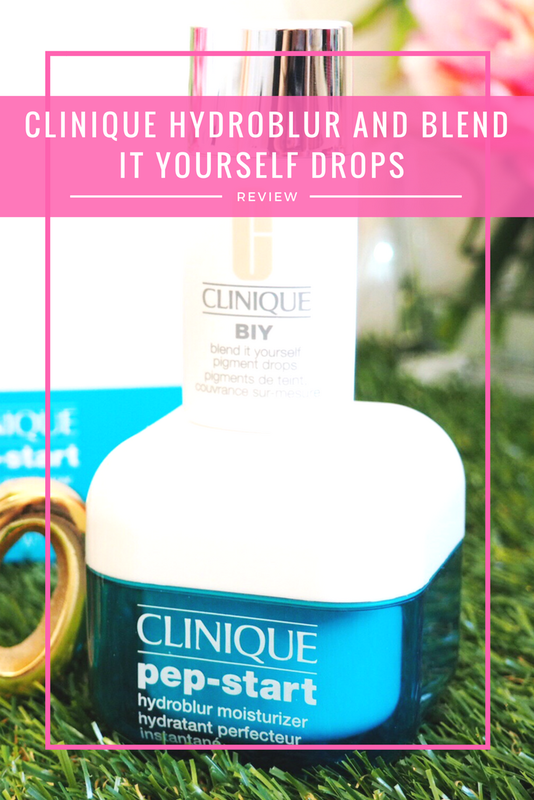 So I shouldn’t really have been as surprised by what I found when I tried their Blend It Yourself Drops along with their Pep Start Hydroblur Moisturiser. First things first – as you know, my skin type is oily. My pores get bigger and more open as the day progresses and I find that managing the shine is a pain by mid afternoon too. The thing that makes this even harder is that my personal preference for make-up coverage is matte. Like…seriously matte. It might not be so bad if I liked the more dewy look, but for me I’m all about the matte. *sassy finger snap* It just so happens that maintaining matte coverage throughout the day is a tad difficult with oily skin. Therefore I’m always on the look out for products – particularly primers and bases – that will help me fight the oil. I’m pretty happy with my current base and primer, so I hadn’t been actively looking for a replacement but somehow just by using these two products, my poor old Holy Grail primer has now been left abandoned in far favor of this duo. The idea behind the Pep Start Hydroblur is something I’m gunna’ be shouting about because it’s basically a filter in a pot. And I’m not remotely over exaggerating – it genuinely blurs your whole face to create the most smooth and matte looking skin. It’s designed to be used under foundation as a primer, but it can also be used throughout the day as a ‘touch-up product’ (although I have yet to try it this way.) The product itself has a really unique texture to it, I can’t really call it a cream because it’s not cream-like. It’s more like silk or velvet as a texture, that you blend on to your skin. It’s so lightweight too – I’ve not felt another ‘moisturiser’ like it before. It’s also supposed to be uber hydrating – which is great if you have dry skin too. The magic of the blur means that when you apply it, pores, fine lines and any imperfections look…well…blurred! Application creates a gorgeous and completely matte finish that looks exactly like those good old Instagram filters we love – that blur out the bad bits and make our skin tone look even and gorgeous. What’s more is that you can get a 30ml pot for only £15, so if you want to give it a go before purchasing the 50ml (£24.50) then there’s an affordable way of doing so. Now these intrigued me from the get-go because I’m a sucker for anything in the make-up world that can be customised. Nothing sounds more appealing than a custom shade of make-up that’s specifically for me and my skin type/tone. So the new Blend It Yourself (BIY) Drops sounded like my kinda make-up. A little tube of colour that’s available in 13 shades to help you transform pretty much any make-up product, these drops are designed to be added to your existing products. Thus turning your moisturiser or primer into a fuller coverage product or BB/CC cream. 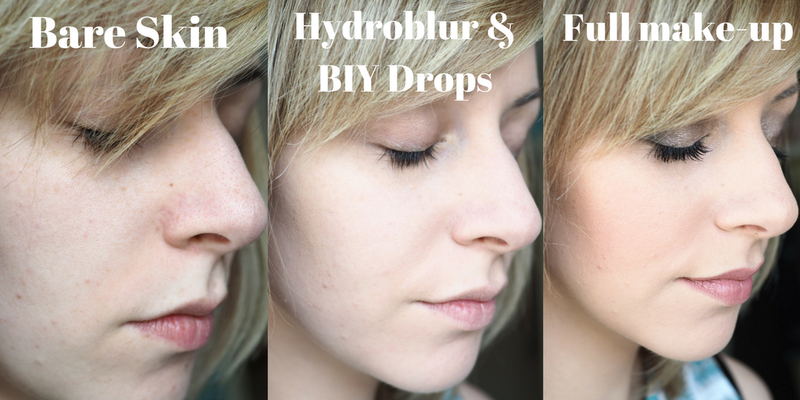 Add one drop of BIY for a sheer coverage, or ramp up to two or three drops for fuller coverage. With a matte finish, the drops help to contribute to a more mattifying affect all over. For me, I mix the two together and it’s this combination that’s created the most PERFECT base for my make-up. Literally like an Instagram Filter. I start by applying a small scoop of the Hydroblur to the back of my hand and then add approximately two drops over the top, and blend with my finger. This creates an all over veil that I then rub in like a cream or moisturiser and within seconds it’s dry and my skin looks blurred and matte. Way matte. It’s a matte lovers dream. Imperfections are masked, pores look barely visible and the texture of my skin is like silk for my foundation. I literally can’t recommend it enough. So, I may not have been on the look out for a new primer, but I am forever on the look out for products to give me a more matte look. So finding these two gems that not only create a matte look that I adore, but also that blur my face to look like everything I love about filters…well, I found what I was looking for without knowing I was looking for it. Not just for ladies who like a heavy make-up look, you can wear the two together without foundation for a more subtle daily coverage too – if that’s more your thing. But for me I’m using this as my first step base and it’s already replaced my Holy Grail Primer on the dressing table. And I’m not even sorry. What do you think? Does an Instagram Filter in a pot sound like your kinda primer too?